Burns to the eyelids lead to scarring which if severe may cause distortion and mal-positioning of the lid, such as ectropion, or lashes eg trichiasis. Burns to the cornea may lead to ulceration, scarring and loss of vision. 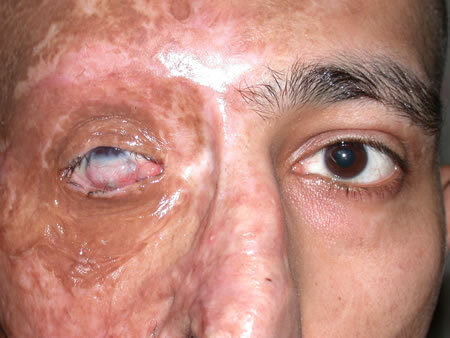 Scarring from burns to the conjunctiva may cause entropion. Freeze injuries to the eye are rare. Those involving only the eyelids often do not cause serious long-term damage. Ultraviolet burns to the cornea, for example from unprotected welding, usually cause severe pain, photophobia and blurring of vision. All burns other than the most minor should be referred to the eye emergency department.